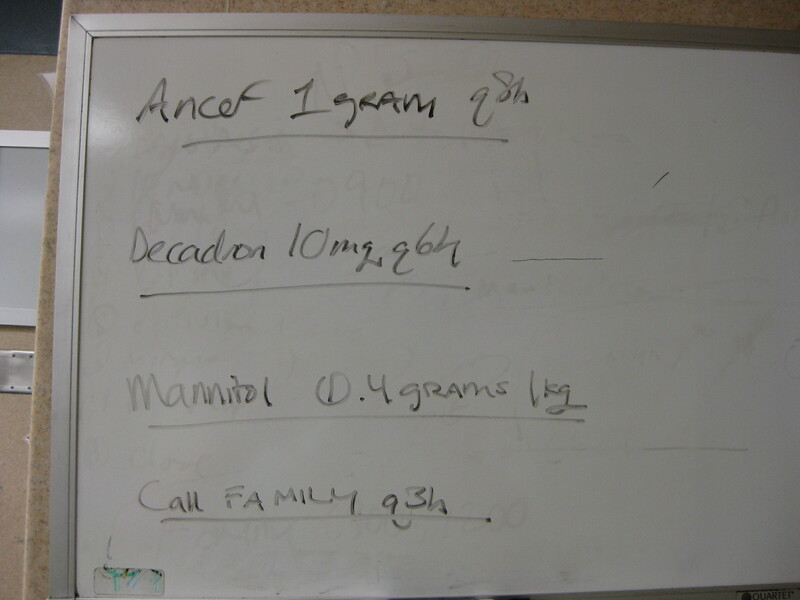 EAP monitor (Megan) - page 15m before needed (when start dissecting tumor). 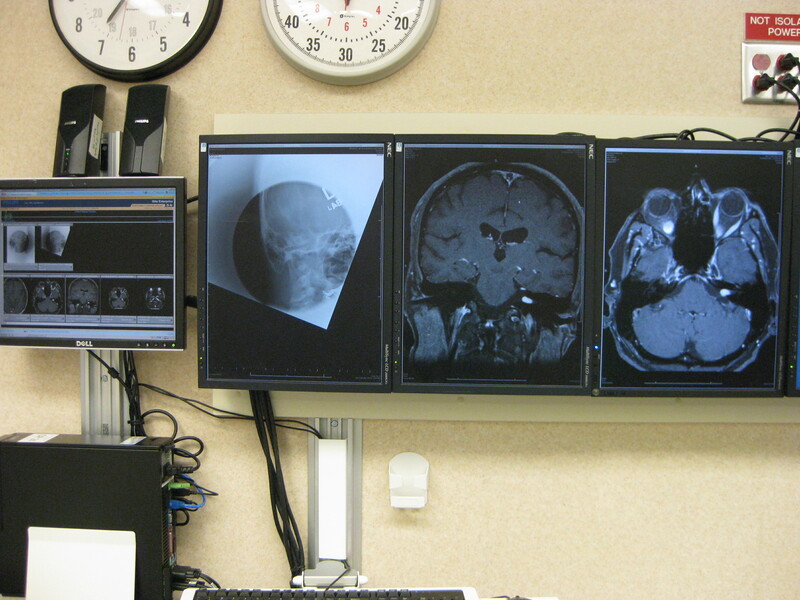 Elevate the temporalis off of the calviarium using periosteal elevator. Again, wrap the muscle in moist raytech to protect from dessication, retract off field with stay suture. Hansen - Close skin with running/locking 3-0 nylon. 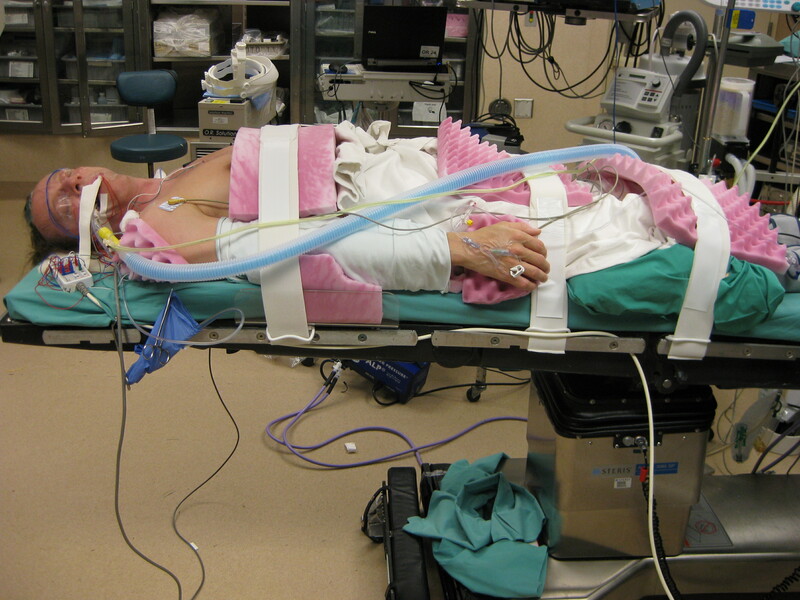 Bulky mastoid-type dressing with adequate pressure to prevent spinal fluid subgaleal effusion from developing. Patient images; Stenver view mastoid to assess bone thickness overlying superior canal; MRI coronal and axial (post-contrast) showing tumor and confirming operative side. 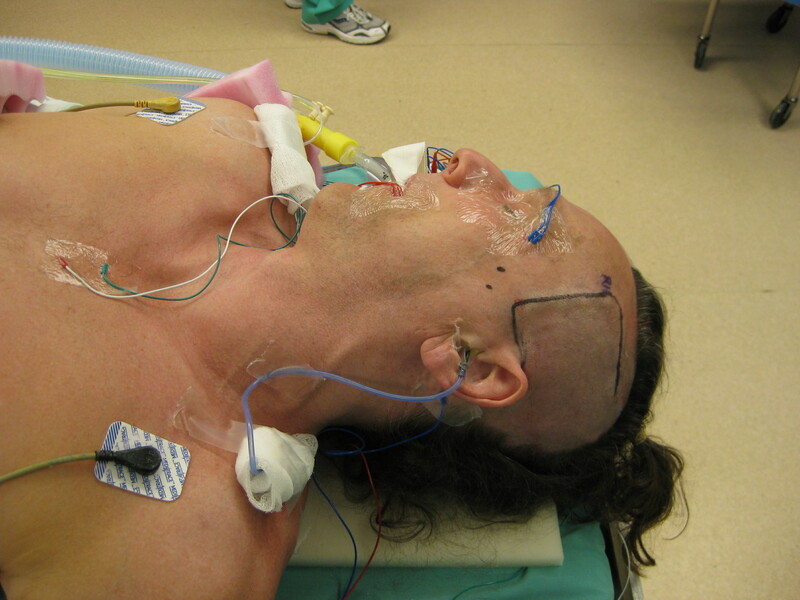 Electrode placement; NIMS monitor electrodes in the orbicularis occuli and orbicularis oris with ground electrods on the chest; ABR click generator in the operertive side ear canal; 3 ABR electrodes (one on each mastoid and one on vertex). Also note the posteriorly based temporal skin flap design. Incision starts just behind temporal hairline and a rounded box shape approx 6 cm wide is carried back approximately 6-7 cm. Use a 4 mm (BJG) or 5 mm (MRH) cutting burr to remove the majority of the bone. Use diamond 4 mm burr, to remove the final layer of bone over the dura. Mark bone flap to ensure easy and properly oriented replacement at end of case. Elevate bone flap off of dural with Joker elevator. 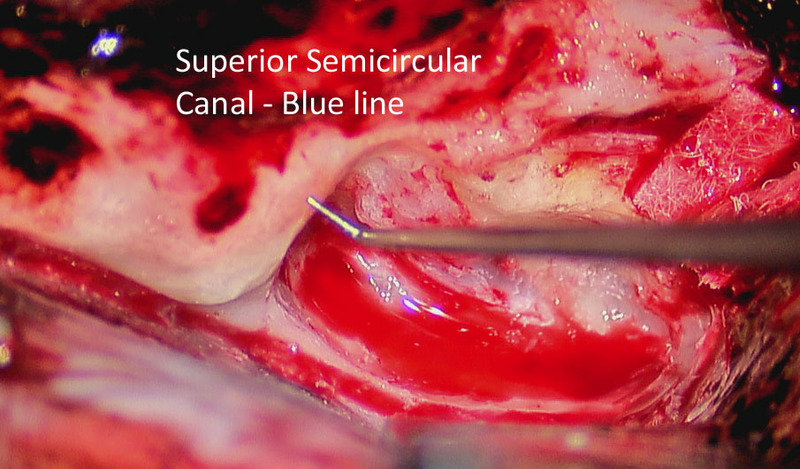 Circumferentially elevate the dura from the overlying cranium, using the bipolar cautery liberally to stop bleeding from the dura. Place Oxycel cigars under the bone flap anteriorly, posteriorly, and superiorly. Identify the arcuate eminence, GSPN, and petrous ridge. Use cottonoids anteriorly and posteriorly for dural retraction during elevation. Brisk bleeding from the middle meningeal artery at the foramen spinosum may be encountered and can be controlled with bone wax and Oxycel packing. Place the House-Urban retractor under the lip of the petrous ridge at the anticipated location of the IAC (based upon the arcuate eminence). Begin drilling using a 4-0 diamond burr over the arcuate eminence to identify the location of the superior semicircular canal. The Stenvers x-ray will demonstrate the amount of bone overlying the semicircular canal (SSCC). 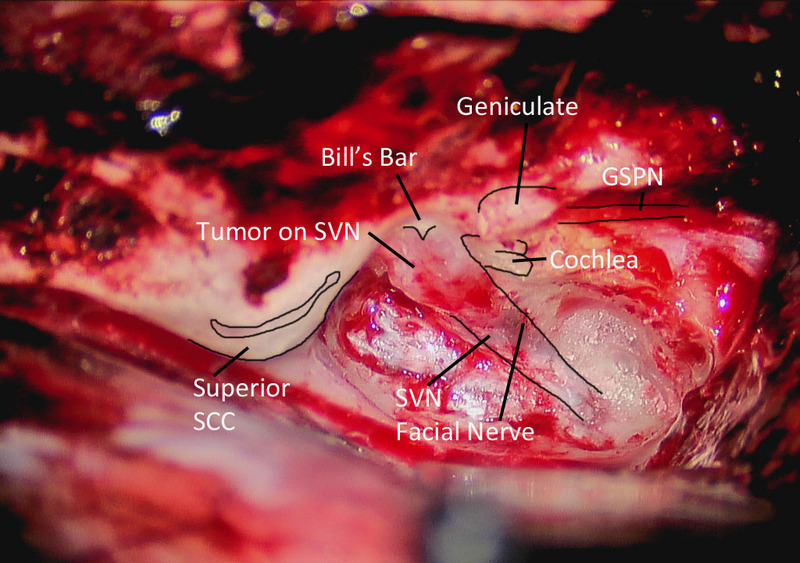 Exercise caution when drilling laterally, due to the location of the cochlea and ampulla of the SSCC. Skeletonize the IAC up the level of Bill\’\’s Bar. Identify the labyrinthine segment of the facial nerve at the transverse crest and decompress the meatal foramen a few millimeters. The cochlea is deeper than the plane of the labyrinthine segment of the facial nerve. As long as one does not drill deep to the facial nerve anteriorly, the cochlea will not be violated. Remove the last flecks of bone from the IAC dura. 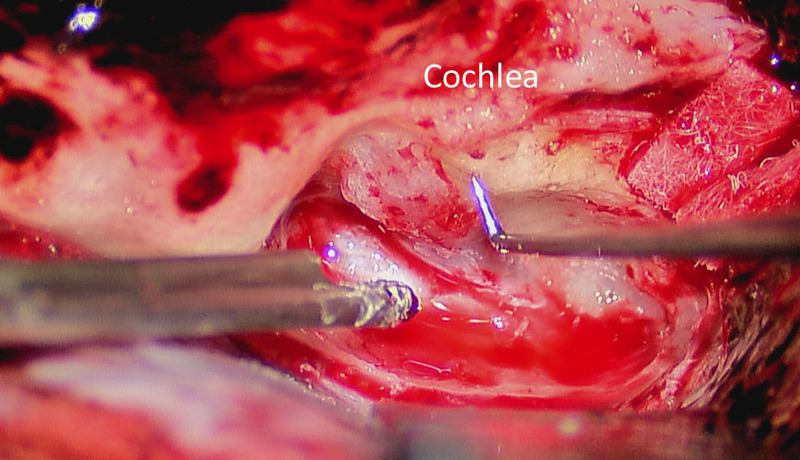 Open the dura of the IAC over the superior vestibular nerve with a 59-10 Beaver blade or 2.5 mm hook. 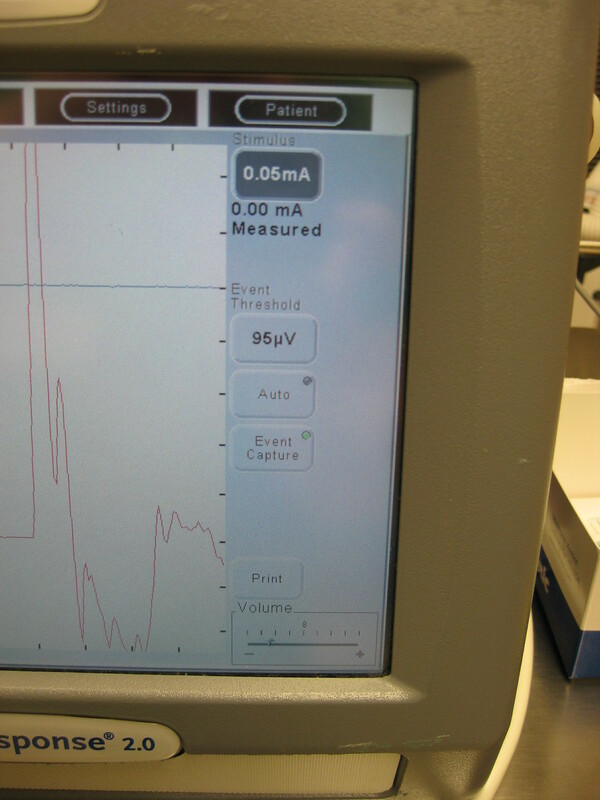 Place a direct auditory nerve electrode between the dura of the IAC and the cochlear nerve for monitoring the cochlear action potentials in real time. 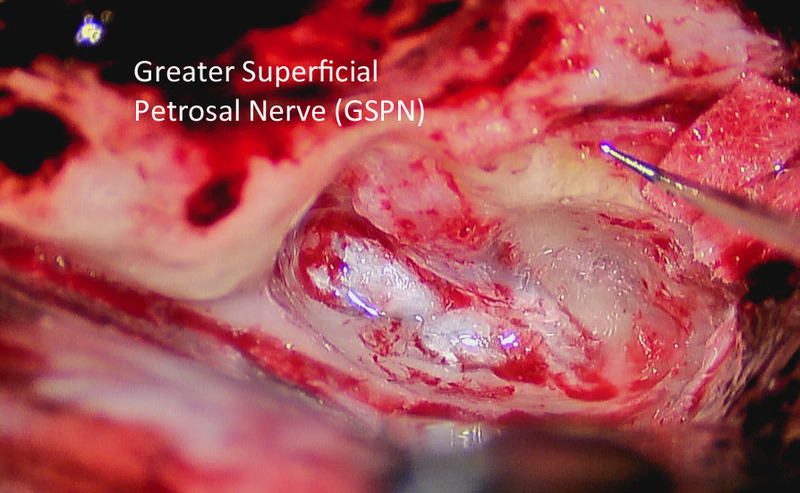 Identify the separation between the facial nerve and superior vestibular nerve at the transverse crest. Separate the facial nerve from the superior and inferior vestibular nerves at this location. Avulse lateral ends of the vestibular nerves, and reflect medially. 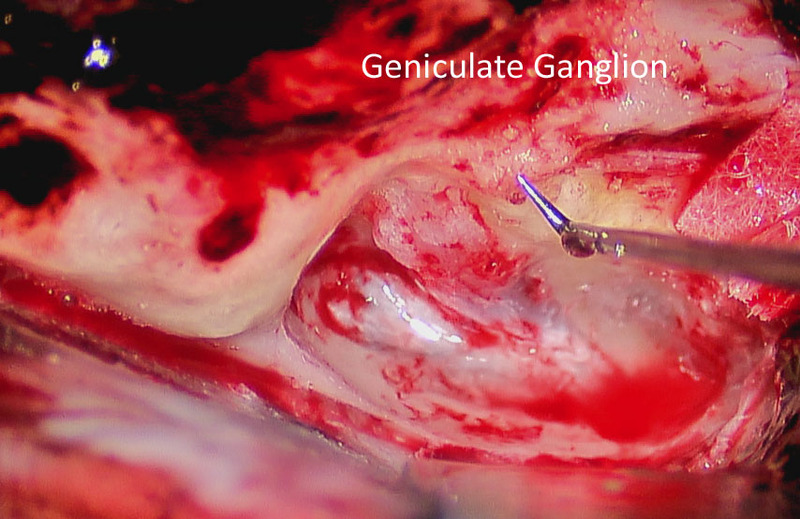 Use a 2.5 mm hook to separate the tumor from the facial and cochlear nerves. Always work from medial to lateral when possible. When tumor has been separated, cut the medial ends of the vestibular nerves along with the tumor, thus removing the tumor. 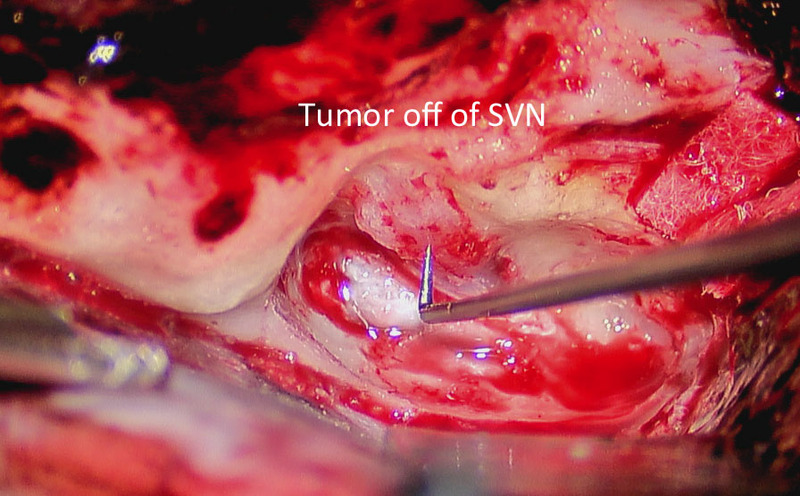 In larger tumors, it is often necessary to debulk the tumor as for TL excision, prior to establishing a plane between the facial nerve and the tumor. If the auditory response demonstrates prolongation of latency or a decrease in amplitude, switch strategies or pause tumor dissection for several minutes. A cochlear nerve that no longer responds intraoperatively may still have hearing postoperatively; unfortunately, the reverse is also true. Apply bone wax to all opened air cells. Place a large temporalis muscle plug (BJG) or abdominal fat (MRH) in the IAC defect. 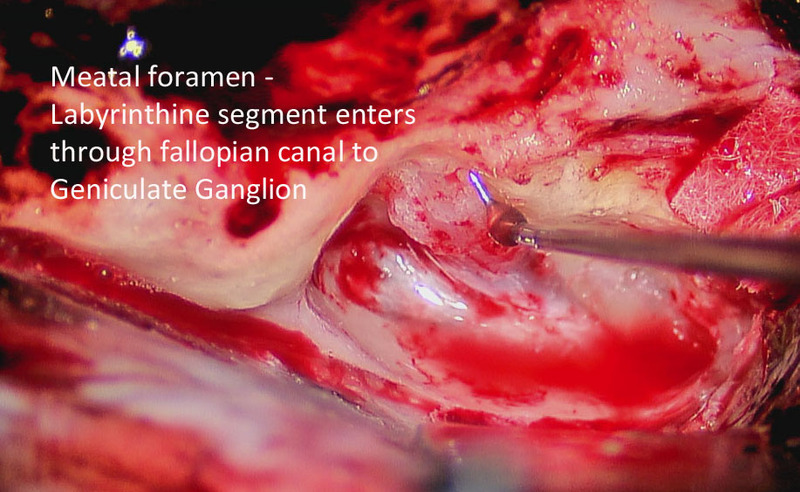 Place the previously harvested fascia over the entire temporal bone defect. Use the anterior corner of the bone flap, or a piece of the inner table, over the defect to prevent temporal lobe herniation into the middle ear, if it exposed. Release the House-Urban retractor and allow the temporal lobe to re-expand. 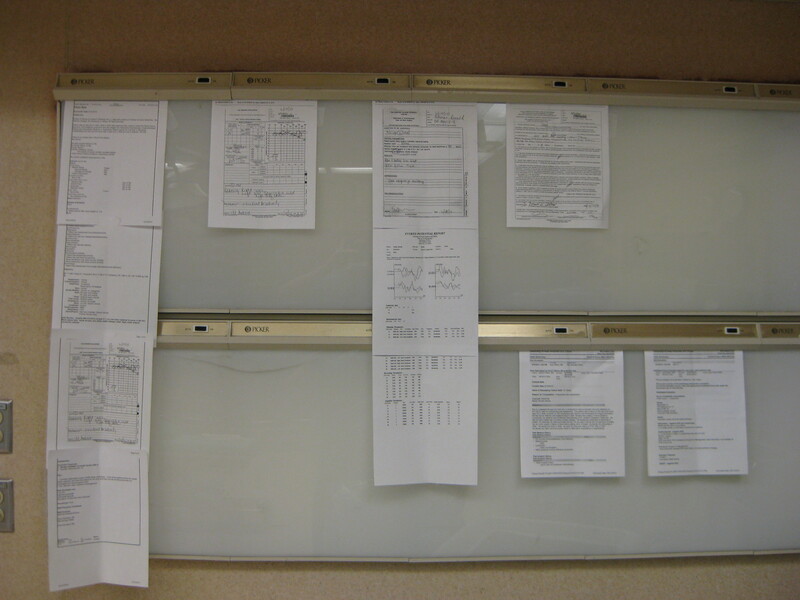 Ensure an accurate neuro pattie count. 9. 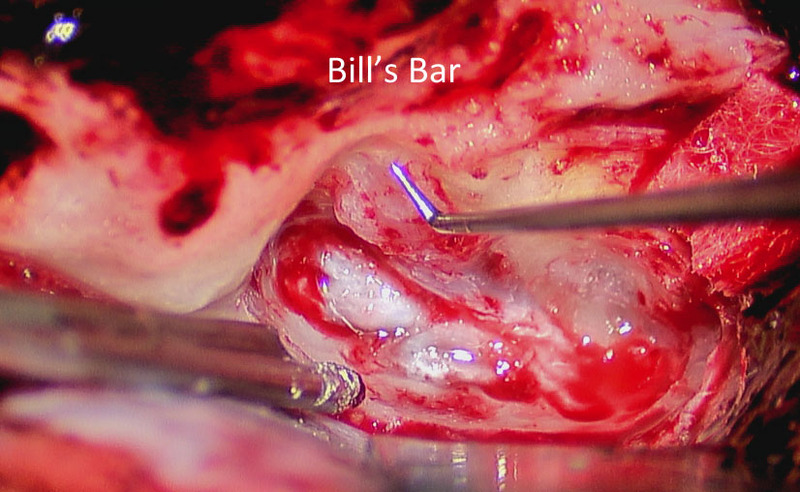 Close the temporalis muscle with water-tight interrupted 3-0 vicryl sutures. Close the subcutaneous layer with water-tight interrupted 3-0 vicryl sutures. Close the skin with running-locking 3-0 nylon sutures. Place a large, tight mastoid dressing centered over surgical area. Chen DA, Arriaga MA, Fukushima T. Technical refinements in retraction for middle fossa surgery. Am J Otol. 1998;19:208-211. Gantz BJ, Harker LA, Parnes LS, McCabe BF. 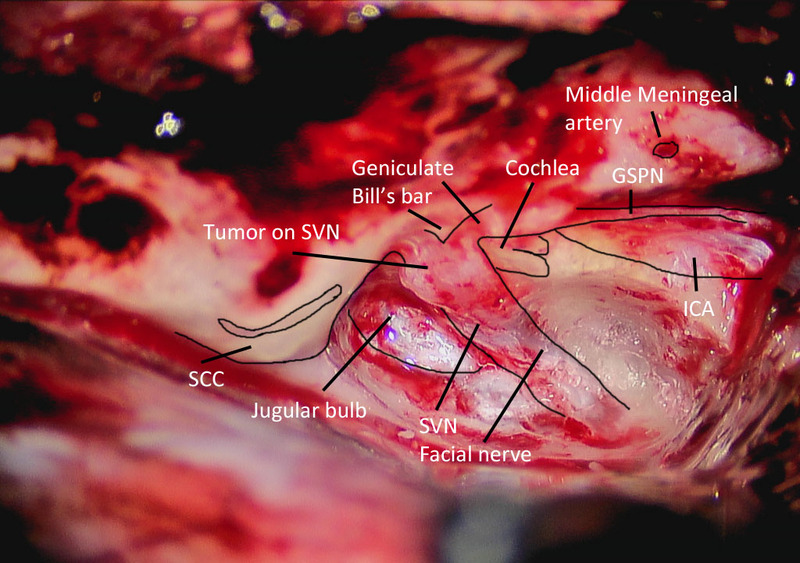 Middle cranial fossa Acoustic neuroma excision: results and complications. Ann Otol Rhinol Laryngol. 1986;95:454-459. Nadol JB. Cerebellopontine angle tumors. In: Nadol JB, Schuknecht HF, eds. Surgery of the Ear and Temporal Bone. New York, NY. Raven Press, Ltd. 1993:391-413. Weber PC, Gantz BJ. 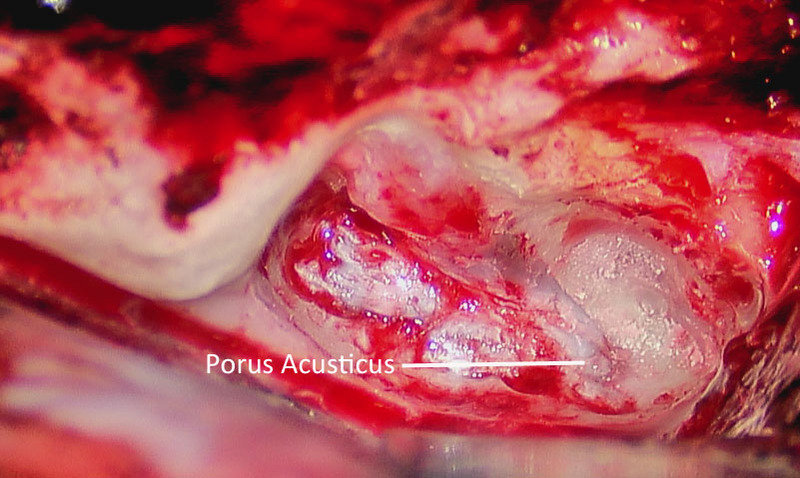 Results and complications from acoustic neuroma excision via middle cranial fossa approach. Am J Otol. 1996;17:669-675.